The Team GB-selected sailor who was forced to drop out of the Rio 2016 Games line-up after being diagnosed with colorectal cancer is getting back on his bike for charity. Elliot says: ‘I was diagnosed with colorectal cancer in November 2015. Due to the amazing doctors, nurses and surgeons at the Royal Marsden and the world class treatment I have been and continue to receive, I am starting to live my life again, and feel able to support this amazing trust by doing something that I used to enjoy so much. Last December it was confirmed by the British Sailing Team that following medical tests, 470 Olympic campaigner Elliot had unfortunately been diagnosed with bowel cancer. Willis, 32, from Sevenoaks was among the first athletes in any sport to be selected to Team GB for the Rio 2016 Games, alongside 2012 silver medallist Luke Patience. Luke went on to regain selection for the Games with crew Chris Grube and achieved fifth place overall after a whirlwind eight month campaign together. Elliot added: ‘The Royal Marsden have been amazing and their pioneering work has led to me receiving a newer type of treatment, immunotherapy (Pembrolizumab), for my type of cancer. The approval for this was made possible by BUPA through UK Sport and I cannot thank them enough for their continuous support on multiple levels, and for enabling and allowing me to receive this new treatment. I hope it can help other patients in the future. 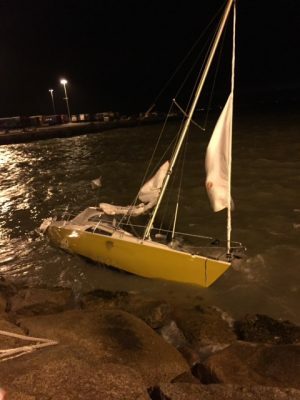 Yachting Boating World: The yacht suffered major damage after it drifted onto the rock armour at Rosslare Harbour in Co. Wexford, Ireland. The RNLI rescued the two people on board. Rosslare RNLI launched its all-weather lifeboat at 3.45am on 14 September following a distress call from a yacht with two people on board. The eight-metre vessel had suffered engine failure and drifted onto the rock armour at Rosslare Harbour. The crew were seeking shelter from the weather, which had worsened to a strong force seven north westerly gale. The RNLI says the wind was blowing into the mouth of Rosslare Harbour. When the lifeboat crew arrived, they found that one of the yacht’s crew had been able to leave the boat and make it onto the rocks. However, due to high waves and the rocks, it was not possible to attach a towline to the yacht from the lifeboat. Two of the RNLI crew successfully managed to get the remaining occupant off the boat from the land side of the harbour. The lifeboat remained offshore providing cover. The couple were brought to the lifeboat station to get warm and recover from their ordeal. They were also provided with dry clothes. They are currently being looked after by villagers at Rosslare Harbour. Speaking after the incident, the Rosslare Harbour RNLI volunteer lifeboat press officer, Jamie Ryan, praised the efforts of the lifeboat crew. “It was a challenging rescue in the early hours as the boat was getting dashed against the rocks and we needed to get the two crew members to safety,” he said. “The best way to recover them was from the land side, with the lifeboat providing cover from the sea,” continued the press officer. “The boat has suffered major damage, but the two people are recovering well from the incident. The couple, who are not from Ireland, are being looked after by the people of Rosslare,” concluded Ryan. Yachting Boating World: The Canal & River Trust has announced that a survey amongst boaters has shown demand for pre-bookable moorings on London’s waterways. The Canal and River Trust says short-stay, pre-bookable moorings are in demand from boaters visiting London. It is now trialling pre-bookable, short-stay mooring spots at Rembrandt Gardens, where the Regent’s Canal meets the Paddington Arm. The trust carried out a survey over the summer as part of work towards its mooring strategy for the capital. It found that perceived pressure on mooring space was putting some boaters off visiting London. Of the 27% of respondents who hadn’t visited the capital by boat, 85% said it was because they weren’t certain they’d find a place to moor. Those who took part in the survey also wanted an increased range of mooring options, with 59% of all respondents saying they’d consider paying for a reserved mooring. Of the 1,400 boaters surveyed, 73% had visited London by boat, of which 45% had visited in 2016 and 18% in 2015. 10% had visited before 2010. Most visiting boaters moored on general towpath moorings (64%) or visitor moorings (63%), with 14% stopping on paid private moorings. 59% of respondents said they would consider paying for a reserved mooring, with most boaters saying they’d pay £10 a night. One of the most important aspects of cruising into central London was security.Having a safe and secure place to moor was important to 92% of respondents, while having a guaranteed place to moor was important to 74%. 63% wanted to moor close to local services, attractions or transport links, while 50% thought it was important to moor close to boat facilities. The boating strategy & engagement manager at the trust, Matthew Symonds, said he was pleased that boaters got in touch to share their views, both positive and negative, of boating in London. “Our job is to manage the finite space on the canals so that all boaters have a fair chance of finding somewhere to moor up, and in popular places like parts of London this becomes even more important,” he explained. “It looks like being able to guarantee a mooring spot will give many boaters peace of mind and encourage them to visit. Taking this into account we’re planning to trial pre-bookable short-stay mooring spots at Rembrandt Gardens which will begin later in the year. We will be announcing more details soon,” he continued. Symonds said the trust had also received a lot of feedback on how to improve boating in London. “It’s no surprise to see that boaters want to see more facilities, and we’re doing what we can to find suitable places to put them. Boaters also want to see more mooring spaces and rings and we’ve worked hard to get funding to install around 3, 500 metres of rings over the past two years, creating or improving around 195 mooring spots,” he explained. “We will continue looking for opportunities like this. Also high on the list were requests to reduce overstaying and better enforcement of the rules. We’re going through the comments carefully and they will prove really useful in the development of our wider London mooring strategy, which seeks to meet the needs of boaters and others who enjoy these historic, popular waterways,” concluded Symonds. The survey ran from 30 June to 26 August, 2016. The Canal and River Trust will also be carrying out further engagement work including surveys of boaters and other stakeholders in London over the coming months to help inform the wider London mooring strategy. Yachting Boating World: Ladies Day on 22 September 2016 promises champagne, fashion shows, live music and, of course, gorgeous yachts to explore at Southampton Boat Show’s marina. 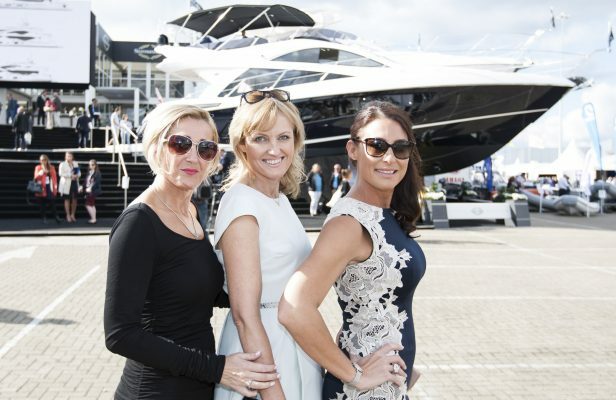 Britain’s largest boating festival, the Southampton Boat Show, has just announced the exclusive features and attractions at this year’s Ladies Day. Held on Thursday, 22 September 2016, Ladies Day guests will have the opportunity to marvel at some of the gorgeous yachts and spectacular feature boats on display. There will also be plenty of opportunities to indulge in a glass of champagne at one of the waterfront vantage points that the show’s bars and lounges have to offer. Live music performances from the likes of Might Be Bublé, as well as fashion shows make this day totally unmissable. Fantastic spot prizes will also be handed out on the day by official media partner for the occasion, the Southern Daily Echo, for the show’s best dressed ladies. The Honda Champagne Bar will welcome the show’s very own Ladies Hour from 2pm to 3pm, where every lady that buys a drink will have the chance to pick the winning key to open a padlock of prizes. “As well as the more relaxing activities with our fashion shows and fabulous bars, the show provides a host of opportunities to get out on the water for free,” he adds. Ladies Day is sponsored by Irwin Mitchell Private Wealth, one of the UK’s leading private wealth firms. “We are already one of the biggest private client businesses in the UK and sponsoring the show highlights our plans to grow our business in the south of England,” she added. The Southampton Boat Show runs from 16-25 September 2016. Yachting Boating World: Two crew died after the wheelhouse of the Viking Freya hit a bridge in the city of Erlangen, Germany in the early hours of 11 September. The vessel is fitted with a retractable wheelhouse. The police and representatives from the boat’s owner, Viking River Cruises, are now investigating the accident. A police spokesman is reported as saying that the retractable wheelhouse may not have been lowered in time. The Viking Freya was leaving Erlangen along the Main-Danube Canal when the accident happened. It was on its way to the Hungarian capital, Budapest. Around 230 people are reported to have been on board. The wheelhouse was crushed in the impact with the bridge. The two crew members killed were a 33-year-old sailor and a 49-year-old who was helming. No-one else was injured in the incident. In a statement, Viking River Cruises said the families of the two men were in their “thoughts and prayers”. “Viking Freya experienced an accident in Erlangen, Germany early Sunday morning. 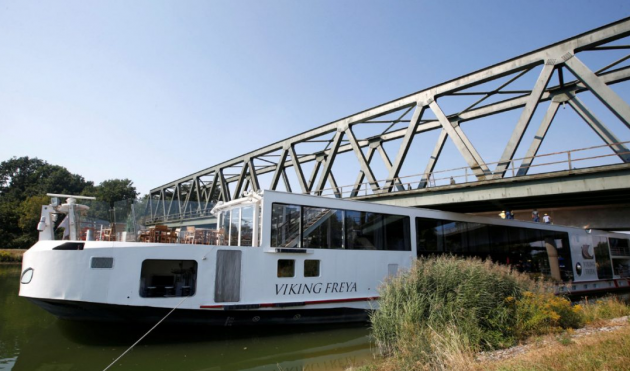 “Viking Freya’s wheelhouse collided with the bridge in Erlangen. “Two crew members of the ship were in the wheelhouse and died as a result of injuries sustained during the collision. “No other crew members or guests were injured, and all guests have been transported to local hotels. “We are heartbroken, and company executives are on the scene to work closely with local authorities to understand the details of the accident. Viking Freya had embarked on its September 10 sailing and will now be moved for repairs. “Guests on this sailing may continue on their journey with a modified itinerary, embarking on Viking Bestla in Passau. Or, they may return home as soon as possible. “Guests currently booked on Viking Freya sailings for the remainder of 2016 will now sail on Viking Bestla, a sister ship that is virtually identical. “Guests on these sailings will be contacted directly by a Viking Customer Relations representative or their travel agent. The families of our crew members are in our thoughts and prayers,” concluded the statement. 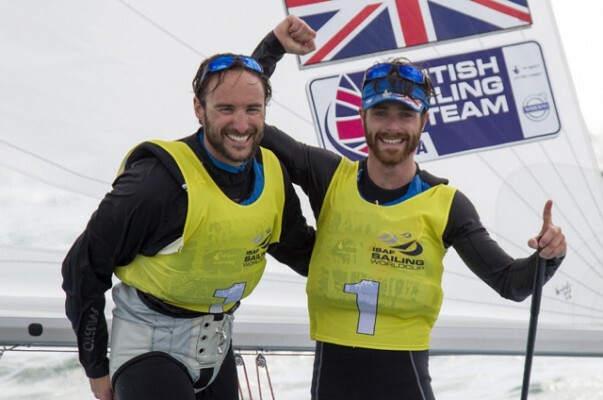 Yachting Boating World: Team GB’s Paralympic rowing team make history at Rio 2016 after taking three golds and one bronze – their best medal haul yet. 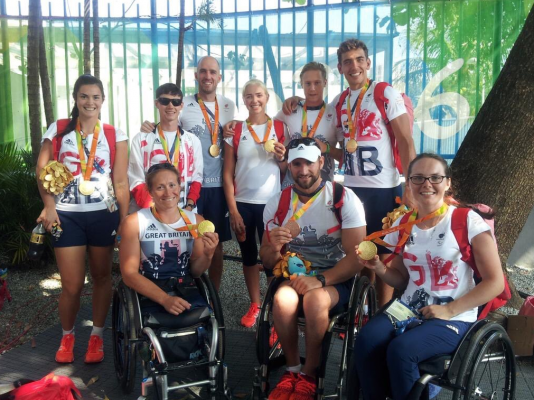 It took just one hour for Team GB’s Paralympic rowing team to win their impressive medal haul at the Lagoa Stadium in Rio on 11 September. Rachel Morris, who only switched from hand cycling to rowing in 2013, was the first of the team to secure a gold medal. She beat China’s Lili Wang and Moran Samuel from Israel, to win the arms-shoulders women’s single scull boat. Morris, who trains at Guildford Rowing Club in Surrey, has previously won gold in the cycling at Beijing 2008 and bronze at London 2012. Meanwhile in the equivalent men’s event, Tom Aggar took bronze. The 32-year-old made history during Beijing 2008 when he took gold in the first-ever arms-shoulders men’s single scull. The four-times World Champion is the longest-serving member of the GB Rowing Team para-rowing squad having made his debut in 2007. Aggar came third in the race after a fierce battle with China’s Huang Cheng. The Ukraine’s Roman Polianskyi took gold and Australian Eric Horrie secured silver. “I am so pleased to have made that cut and to have got on the podium,” said Aggar. “The event has moved on hugely since Beijing and it’s an amazing feeling. We did a lot of rehearsals of having to race three times here and I knew I had the fitness so being in the repechage didn’t faze me,” he noted. World Silver medallists Lauren Rowles and Laurence Whiteley clearly showed why the gold was theirs after blasting from the blocks in the final of the trunk-and-arms mixed double sculls. The pair beat the world record in their heat and dominated the final to take the top podium spot. “I don’t think I can sum up the emotions,” said Whiteley, who only partnered with Rowles in 2015 after a two-and-a-half-year search. “Two and a half years of thinking every day that it would be alright in the end. There were days when I could have walked away some days but for the end prize to be Paralympic gold, I would have done it again in a heartbeat,” he said. Meanwhile, Grace Clough, Daniel Brown, Pamela Relph, James Fox and cox Oliver James retained GB’s Paralympic crown in the mixed coxed four. Making their mark from the start, the team was leading comfortably half way through the race, with clear water by the finish. They won in a time of 3:17.170. Yachting Boating World: Turn your car into a boat! Turkish engineer Yusuf Kahvecioğlu didn’t have the money to buy a motor boat. Instead, he designed his Drive on Water prototype to open up boating to anyone with a car! Frustrated because he was unable to afford his own motor boat, Yusuf Kahvecioğlu decided to design his own and built his Drive on Water prototype. Known as D.O.W, he has now launched a Kickstarter campaign to develop the project. He wants to raise $20,000 Canadian so he can modify the prototype. “I made a prototype, it works fine but it is a little slow, needs more modifications,” explained Kahvecioğlu. The D.O.W uses the car’s engine for power, and has the same horse power as the vehicle. Facilities in the car, such as air conditioning and music system, can also be used while out on the water. According to the project website, it is controlled by a joystick and can be used for cars with a maximum length of 5 metres. “Now you can ride a boat while you are driving!” writes Kahvecioğlu on his Kickstarter page. “Now you can ride a very cheap catamaran motor boat while sitting in your car. Your boat uses your car’s engine, electrical system, etc. If you have 150 HP car, now you have a boat with 150 HP engine. You also bring your car wherever you go by boat,” he explained. Kahvecioğlu, who has previously designed planes, has collected just $327 from 11 backers so far but he is hopeful others will be inspired to support his project. He is collaborating on D.O.W with physicist and designer Zafer Caner. Caner has previously worked on other innovative projects including the Korea solar powered car. Yachting Boating World: P&O Cruises has announced that it has ordered the next generation of mega ship. It will eclipse the British cruise line’s current 3,637-capacity flagship, Britannia. 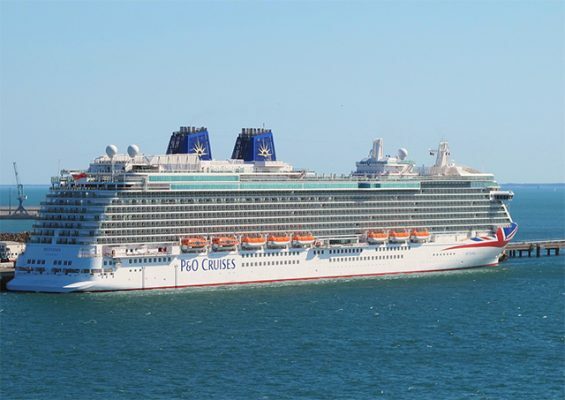 The new ship for the British cruise line, P&O Cruises UK, will be able to accommodate 5,200 passengers. This is 1,563 more than its current flagship, Britannia, which was officially launched by The Queen in Southampton in March 2015. P&O’s parent company, Carnival Corporation, which is based in the US, announced that it had signed the deal to build the new ship earlier this week. It is expected to be delivered in 2020 and will be built by Meyer Werft at its shipyard in Papenburg, Germany. Based on Carnival Corporation’s next-generation “green cruising” ship design, the new vessel will be part of the first generation of cruise ships to be fully powered by liquefied natural gas (LNG). The company claims using LNG both in port and on the open sea will significantly reduce the ship’s exhaust emissions. It added that LNG is “the world’s cleanest burning fossil fuel”. The new P&O 180,000-tonne cruise ship is one of seven LNG-powered vessels being built for Carnival Corporation. The first of these ships is expected to be in service for AIDA Cruises and Costa Cruises in 2019. CEO of Carnival Corporation, Arnold Donald, said: “We are proud to be at the forefront of introducing LNG-powered ships to the cruise industry, working with our partners to achieve shipbuilding breakthroughs like this that will help us produce the most efficient and sustainable ships we have ever built”. “Every time we launch a new ship, we have a new opportunity to create excitement and show consumers why cruising is a great vacation at an exceptional value, especially for those who typically consider land-based vacations,” added the chief executive. Managing partner of Meyer Werft, Bernard Meyer, said the company was excited to welcome P&O Cruises back to Meyer Werft in Germany. “These new ships will be built in our most modern and environmentally friendly facilities, and we are very proud to design, build and deliver these ships that provide breakthroughs in innovation and for the environment,” he said. As part of its fleet enhancement plan, Carnival Corporation has already taken delivery of three new ships in 2016 for its AIDA Cruises, Carnival Cruise Line and Holland America Line brands, and plans to launch the all-new Seabourn Encore in December 2016. Carnival Corporation has a total of 18 new ships scheduled to be delivered between 2016 and 2022. Yachting Boating World: The Marine Accident Investigation Branch has launched an investigation after a 22-year-old man died while fishing with his family off Hartlepool Marina. A 22-year-old man has died after falling from the fishing boat, Pauline May, east of Hartlepool Marina. Cleveland Police said the man was setting lobster pots in the early evening with his brother, nephew and a woman when his foot got tangled in the ropes of the fishing net and he fell into the sea. He was in the water for a very short time before being recovered. The incident happened about half a mile off the Heugh Pier. The Humber Coastguard tasked Hartlepool RNLI to attend the incident. Both the Atlantic 85 Inshore lifeboat and the all-weather lifeboat responded. 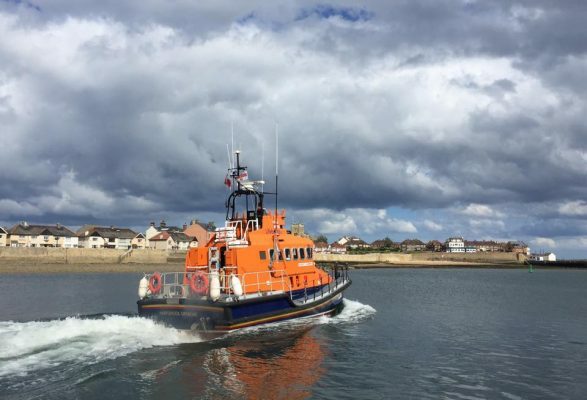 “The all-weather lifeboat arrived moments later and Hartlepool RNLI’s doctor was transferred to the fishing vessel and took over the CPR,” continued the spokesman. “The fishing boat was escorted to Hartlepool Lifeboat Station while the medical care continued on the casualty. He was transferred to the pontoon where the all-weather lifeboat is moored and further efforts were made to revive him,” said the spokesman. The 22-year-old man was then transferred to the care of paramedics with the Great North Air Ambulance. In a statement, the Marine Accident Investigation Branch said it had “started an investigation into the fatal man overboard from a UK registered 8.2m fishing boat Pauline Mary (WY 845), east of Hartlepool, England, on 2 September 2016”. Yachting Boating World: Called Maritime Autonomy Surface Testbed (MAST), the drone boat has undergone sea trials ahead of the Unmanned Warrior exercise in the autumn. 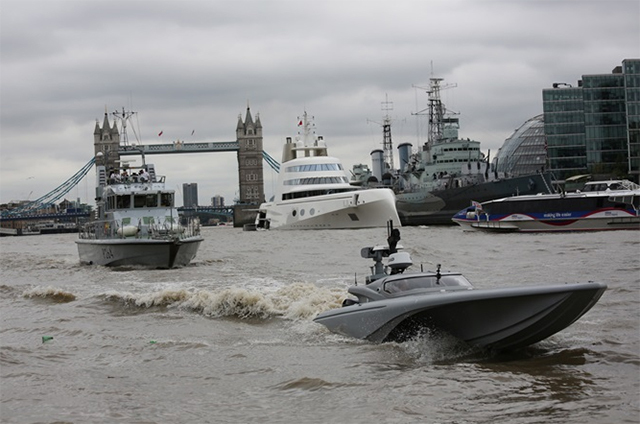 The Royal Navy’s latest vessel – MAST – has been put through its paces on the River Thames ahead of so-called “robot wars” next month. The 32-foot drone boat is one of over 40 Autonomous Systems taking part in Unmanned Warrior 2016 in October, off West Wales and North West Scotland and the Western Isles. MAST, which is based on the innovative Bladerunner hull shape, is being developed by Portchester-based ASV Ltd, under research funding from the Defence Science and Technology Laboratory (Dstlis). It is designed to reach high speeds. Various levels of autonomy include basic remote control up to autonomous navigation. The boat senses other vessels in the immediate vicinity and is programmed to avoid them in a safe manner. The Royal Navy said the avoidance algorithms are designed to comply with internationally mandated collision regulations. When operating on a busy waterway, such as the River Thames, the craft is operated with a coxswain on board ready to take control. “Unmanned maritime systems will change how we operate, but they’re just the start. Our pursuit of new technologies and ideas – from big data to 3D-printing – will ensure we remain one of the most capable and successful navies in the world,” added Sir Philip. MAST does not carry weapons, but is designed to explore autonomous capabilities and support non-lethal surveillance and reconnaissance roles. The work is funded through Defence Science and Technology Laboratory, which conducts research on behalf of the Royal Navy and the other UK armed forces. The work is being conducted by civilian manufacturers ASV Ltd & Roke Manor Research, with support from Cambridge Pixels, Seebyte and Chess Dynamics. During Unmanned Warrior in October, engineers and scientists will be able to demonstrate state of the art technology to the Royal Navy and representatives from other NATO countries. The Royal Navy says it is the biggest event of its kind, and will explore the ideas that “will help shape the future of Naval Warfare for decades to come”. It is linked with the regular Joint Warrior fleet Exercise and aims to test systems in an operational environment. © 2012 Velos Insurance Services Ltd.
Authorised and regulated by the Financial Conduct Authority. Registered in England. No. 3484870.